Gorgeous icy treats, super-easy, with real fruit. 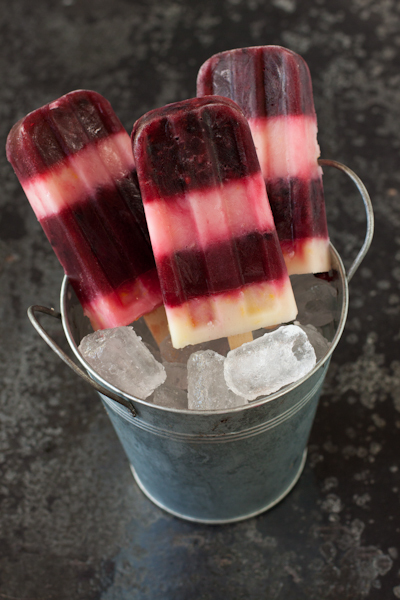 Blackberry-lemon popsicles. 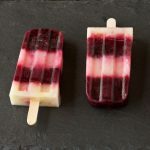 I’m kicking off July’s theme of frozen treats with these beautiful and easy-to-make blackberry-lemon popsicles. They just take time and patience to get this layered look. Made with real fruit, unsweetened fruit juice, and the smallest possible amount of agave syrup or honey to sweeten the lemon portion. Migraine peeps: Omit the lemon portion if you’re not certain whether lemon is a trigger for you. Pulse the blackberries with the blackberry juice until berries are broken down but not puréed. If using a Vitamix, leave on 1. Kids might prefer it if they are completely puréed. You can strain the blackberry seeds out if you don't have a high-speed blender. Fill popsicles molds 1/4 of the way. Do not add the sticks; put them in warm water to soak. Freeze popsicle molds for two hours. Refrigerate the blackberry blend. Press sticks firmly into the first layer and freeze another 60 minutes until very firm. Zest lemons as you juice them. I used four small lemons for this recipe. Stir lemon juice, coconut milk, agave syrup or honey, and lemon zest together. Fill popsicles molds to the halfway point. It's easier to fill the molds from the side. Freeze for one hour. Refrigerate the lemon mixture. 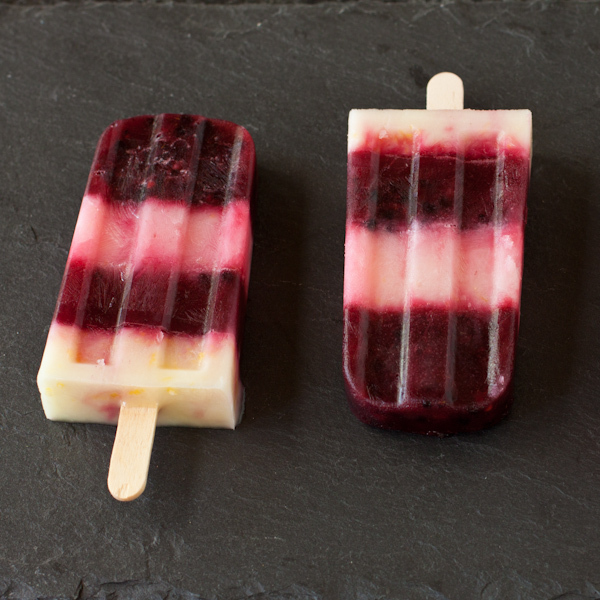 Fill popsicle molds to the 3/4 point with remaining blackberry blend. Freeze one hour. Fill popsicle molds just to top with remaining lemon mixture. Freeze one hour or overnight. To unmold, pop individual molds out of the metal tray. Fill a tall glass with warm water. Hold mold in water to just below the edge and count to 15. They will slide right out. Freeze in ziptop bag. These sound so good! I love the blackberry and lemon combination. Perfect for hot summer days! Thanks Lisa, yes, they are super refreshing on very hot days. These look wonderful and so refreshing Stephanie! I haven’t seen blackberry juice in the store – will have to keep an eye out. Hi Alisa, pretty sure I got it at Trader Joe’s. So yummy. Wow! These are so eye catching and I love the combination of blackberries and lemon – super! 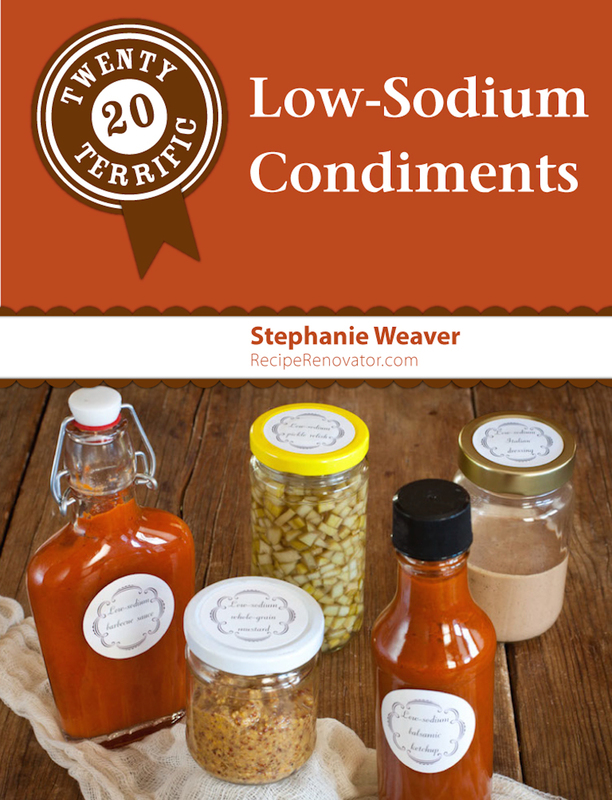 I love how you taylor your recipes to those who have special dietary concerns. Thanks Kim. My mission is to help people on special diets feel loved and give them beautiful food choices! These are so beautiful, it seems almost a shame to eat them … almost! Thanks Kim. They were a big hit in the neighborhood.